LOW PRICE—Our everyday, low prices are exactly that. Our prices are comparable to the lowest prices you’ll find anywhere. Everyday. All the time. TOP QUALITY—Comfort Blind’s entire selection of custom-made window coverings are made by some of the top manufacturers in the industry. The quality of our window blinds and shades are comparable to that of all the major brands. GREAT SELECTION—Comfort Blinds offers the latest styles and colors in all our lines of blinds and shades. From our most popular Cellular Shade honeycomb collections to the exotic, natural look of our Woven Wood selections, we have the right look for you. 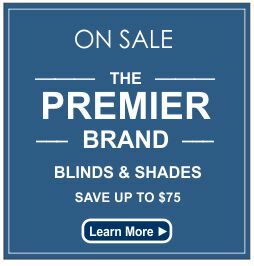 EXTRA SAVINGS—You already save big with Comfort Blinds everyday, low prices. But you can save even more during one of our Special Promotions held throughout the year. These are real savings off our regular everyday, low prices. FREE SHIPPING—Most every order is shipped free to you usually by UPS or FedEX. There is a shipping charge for orders being delivered to Alaska or Hawaii and for blinds wider than 94”. NO SALES TAX—You are not charged any sales tax on your custom blind or shade orders. Michigan residents will be required to pay 6% sales tax. FREE SAMPLES—If seeing the actual color and feeling the texture of your blind or shade selection is important to you, Comfort Blinds will send you up to 10 FREE sample swatches to help you make the right decisions. SECURE ONLINE SHOPPING—You can order with confidence through Comfort Blinds online shopping. Your transaction and personal information are safe with our secured website. SERVICE YOU CAN TRUST—Enjoy your shopping experience with Comfort Blinds. We will do everything we can to ensure your complete satisfaction with our products and our service. 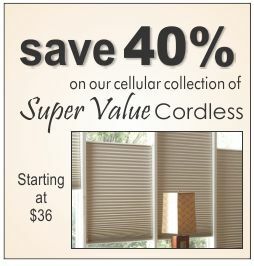 VALUE—At Comfort Blinds, our LOW PRICES, GREAT SELECTION and TOP QUALITY come together to offer you the BEST VALUE around in window coverings for your home!